We specialise in providing ticketing systems for small transport operators in the UK. Every operator has a unique set of requirements and our priority is to make sure that we build a system and supply equipment that works for both the customer and the business. If you are thinking it might be time to upgrade your exisiting system then we would love to talk to you. We provide a range of services, from a fully integrated ticketing system down to some basic hand held machines. Like the London Oyster Card, credit is purchased in advance and either held on the physical cards or on a central online account. For use on board ferries, buses and trains. Lightweight, waterproof and easy to use. Issues paper tickets, scans smart cards and integrates with your online sales and accounts. For your ticket offices and kiosks. Integrated with your website, high volume paper ticket printers, smart card scanners and easy to use. Go ticket and cardless. Passengers can download your app, buy their ticket or load up with credit and then travel on your services. Tickets and credit can be deducted by bluetooth proximity sensors, crew, barcode scanning or GPS. Sell your tickets online. Passengers can print tickets with a QR code or just show their ticket when they board. You just have to scan the ticket. We provide you with a full reporting system. Everything your accounts department needs as well as lots of great business intelligence about what your customers are doing and when. We can provide you with a full responsive website including online ticketing. Each system we install is fully customised around the specific requirements of your operation and business. 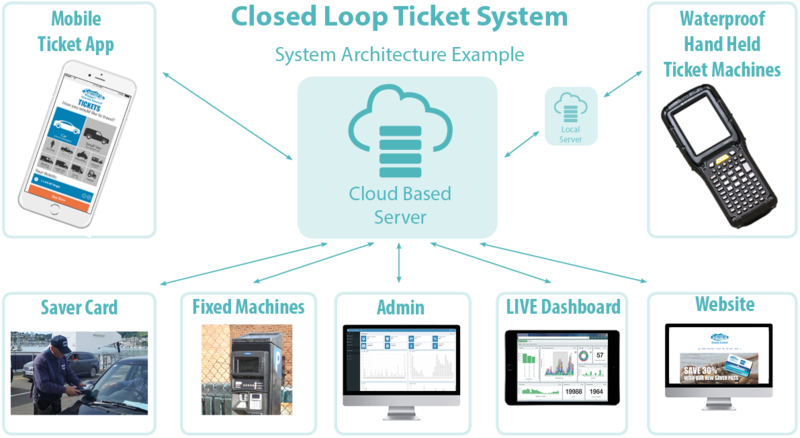 Would you benefit from upgrading to a ‘Closed Loop’ ticketing system? More and more customers are asking us for a ‘closed loop’ ticketing system. What this means is that every single passenger journey is accounted for. This is achieved by installing a cloud-based server that communicates with everything that issues tickets (ticket offices, machines, and website), as well as all the equipment that checks or scans the tickets when your customers travel on your ferries, buses, and trains (handheld machines, gates, tap on/off stations etc). Prevent fraud – Using this system, every single passenger or vehicle carried on your assets has to present some kind of ticket. This ticket is then scanned onboard (via RFID or bar/QR code) and this information is sent back to the cloud-based server, live. This makes it almost impossible for staff to take money or favors from passengers in return for travel or a discount. We can provide specific admin reports and security audits that allow you to manage this and plug this often significant hole in your income stream. User data – By using a closed loop system, we can set up reporting systems that tell you who traveled when and on what. This data, including service and route utilisation and revenue, is invaluable for making an informed objective decision when it comes to deciding what routes and times you will run your services on in the future. Live reporting – See who is traveling on what and where in real time with our ‘Live Travel Dashboard’ – available via a web browser or using our app. Use this to inform operational decisions on the ground and provide the most efficient service possible for your passengers. Remove cash – A bi-product of a closed loop system is that it is possible to significantly reduce or even remove cash from your assets. If you think your business would benefit from a closed loop ticketing system then please get in touch.